Thinking of purchasing a new Toyota? Toyota is devoted to safety and dependability, and proper vehicle maintenance is important to both. That is why we include a no-cost maintenance plan with the purchase or lease of every new Toyota for two years or 25,000 miles, whichever comes first. 24-hour roadside assistance is also included for two years and unlimited miles. Welcome to the ToyotaCare advantage. Thanks to ToyotaCare, you can rely on our Toyota-trained technicians to service your vehicle and keep it at optimum performance. Plus, we will keep a comprehensive record of your service, helping you remember when it is time for your next appointment. And when you are away from our facility, you can drive confidently knowing you are covered by roadside assistance. *ToyotaCare covers normal factory scheduled maintenance for two years or 25,000 miles, whichever comes first. 24-hour roadside assistance is also included for two years, regardless of mileage. See Toyota dealer for details and exclusions. Valid only in the continental U.S. and Alaska. We Will Make It Easy To Take Care Of Your Toyota. Toyota-trained technicians will help keep your Toyota a Toyota by completing factory-recommended maintenance, while keeping a complete history of your service visits. Toyota will also deliver timely reminders before your scheduled maintenance. We Can Help Get You Moving Again. 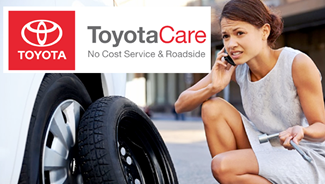 ToyotaCare features 24-hour roadside assistance available at no cost for two years from the effective date for unlimited miles. *Roadside assistance coverage is two years unlimited mileage. See Toyota Dealer for details and exclusions. Valid only in the continental U.S. and Alaska. *Impaired tire will be replaced with your inflated spare. *Extrication from any ditch, mud, sand, or snow. Vehicle must be immediately adjacent to a regularly traveled road and capable of being serviced with standard servicing equipment.